It's weaker than Season 1. I didn't mind it, but it's no more than okay and I have no particular urge to see them make Season 3. What happened in Season 1? Ayato, Julis, Saya and Kirin went to Seidoukan Academy (magical battle school) and entered the Phoenix Festa (magical battle tournament)! It's a light novel adaptation, by the way. Ayato is thus a saint with awesome superpowers who's beloved by all the girls, but on the upside he's also fairly down-to-earth and likeable. I was able to believe that I was looking at a person. The show's mildly harem-y, but not too much. Furthermore quite a lot happened, with our heroes overcoming their personal issues (Julis's emotional distance, Kirin's bullying uncle), fighting each other and getting attacked by shapeshifting lizard assassins. Season 2, on the other hand, is split unevenly into two comparatively uninvolving halves. First is the Phoenix Fest. Our heroes fight in the tournament. They're decent fights and I had no objection to watching them, but it's still basically just a sports championship. It doesn't matter. It's what this world has instead of football. It's just fighting for its own sake, with nothing at stake beyond a prize for the winner. It's entertaining, but no more. No one's going to die and any fighter could choose to drop out at any time. Admittedly some of our heroes have personal reasons for wanting to win and I was cheering them on, but I was also happy when the tournament eventually ended and the show could move on to something other than back-to-back battles on live TV. There's also a kidnapping, mind you. That was good. At last, some action outside the arena! I also liked the robots, especially the male one's hot-blooded, triumphalist line delivery. He's adorable. He's so bombastically happy about everything! After that, the second half has some political discussion (my favourite bit of the season), followed by some new foes trying to kill our heroes. That's a bit dull. Again, the enemy doesn't have much motivation. They're just mindless monsters being summoned by someone who's doing it for the money. In fairness there's one exception to that (Miasma Girl), but otherwise it feels like a quick filler arc en route to yet another magical fighting tournament in Season 3. After Phoenix Festa, next is Gryps Festa! Wheeeee. I'm not expecting Season 3 to get made, to be honest, although anyone who wants to know what happens next can always read the light novels. I enjoyed the political content, though. 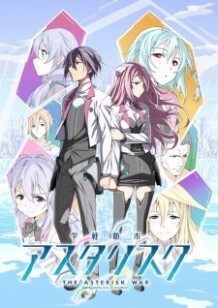 Everyone visits Julis's country, Lieseltania, and the show remembers that this is supposed to be an SF dystopia under the rule of a mega-corporation. We already knew that Lieseltania was a puppet state, but we hadn't met Julis's slightly pathetic brother (the de facto king because that's convenient for the people who are really in power) and we certainly hadn't seen Julis going into this much detail about what's wrong with her country. The characterisation takes a slight step backwards, probably because the weak storyline's giving everyone less to do. Julis fares best. Saya and Kirin are actually okay. A couple of minor male characters astonished me by getting a bit of business, which was good. However Ayato's a bit blander than in Season 1, while Claudia is a big disappointment and never gets to be even slightly villainous. She's not even outrageous! If they do make Season 3, I'm looking forward to seeing what happens to Miasma Girl. She had an impressively tragic backstory. However I'm in no hurry to be reunited with Annoying Laugh Girl (ep.24). It's okay. I don't know if I'd call it good. Apart from anything else, it has battle scenes where the heroes can stop fighting and have an Emotionally Meaningful Conversation without being attacked by the enemy. It also has some ridiculously big weapons. Those look silly... but hey, they're magical. I can live with them. I'd watch Season 3 if it came along, but a lot of that is stubbornness about finishing what I've started and I think this year was clearly weaker than Season 1. Has the show already run out of steam? It seems possible. They'd need to return to more meaningful storytelling if they wanted to drag this back to something you'd recommend to people. I don't hate it, though. My favourite characters this year were Saya and Kirin. The robots are great. Miasma Girl is attention-grabbing. It's watchable.